The 2009 sculpture by Mona Hatoum toys with the viewer’s sense of familiarity and comfort. Witness echoes the surrealist art in the adjacent section, experimenting with scale and perception. 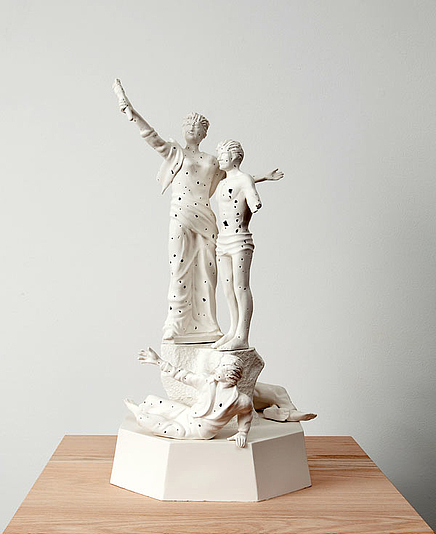 The sculpture draws directly from Lebanon’s 20th century history and is a miniature, porcelain reproduction of the bronze monument located in the centre of Beirut’s Place des Martyrs (Martyrs Square). The original monument was created to commemorate the Lebanese nationalists who were hanged during WWI by the Ottomans, is riddled with bullet holes from Lebanon’s Civil War (1975-1990).